I get it. YOU like comedy, everyone likes comedy and it’s basically just a person saying stuff into a mic right? – You can just book that act you saw on Live At The Apollo, tell them what time you want them on at your corporate dinner and it’ll be a smash! Wrong. Oh so terribly, terribly wrong. Now. Don’t misunderstand me if you’ve booked your event via one of the excellent top flight corporate event organisers out there they’ll be experienced enough to know about the pitfalls I’m about to talk about but increasingly I’m finding in the post recession world we live in more and more corporate events are being organised directly by someone at the host company. Sure they are booking acts through a really good entertainment agency and yes they have the venue arranging the food, staging and A/V equipment but good as those two suppliers may be, they are both just (quite reasonably) focused on delivering the individual aspect they are suppling to the highest standards and that may mean that the two things you require to successfully put on an after dinner comedy act will fall between the gaps and no one will notice to pick them up. So tell me Doug, why can’t I just book an act, have them turn up and leave my guests doubled over with laughter? Let’s look at the two main issues. 1. Getting the Venue Set Up Correctly. Unless you have a seasoned event organiser with extensive knowledge of putting on comedy acts overseeing your corporate event then the room will be set up in a “standard issue” way which is frankly going to be designed to allow the serving staff to execute an efficient food service, let the venue DJ be next to the dance floor and will result in round tables & the dancefloor directly in front of the stage because that set up makes those things as easy as possible. The problem is that comedy is a unique art form, unlike music it requires engagement from the audience. Comedy is a conversation between the comedian and the audience where the latter party is only occasionally asked to speak. 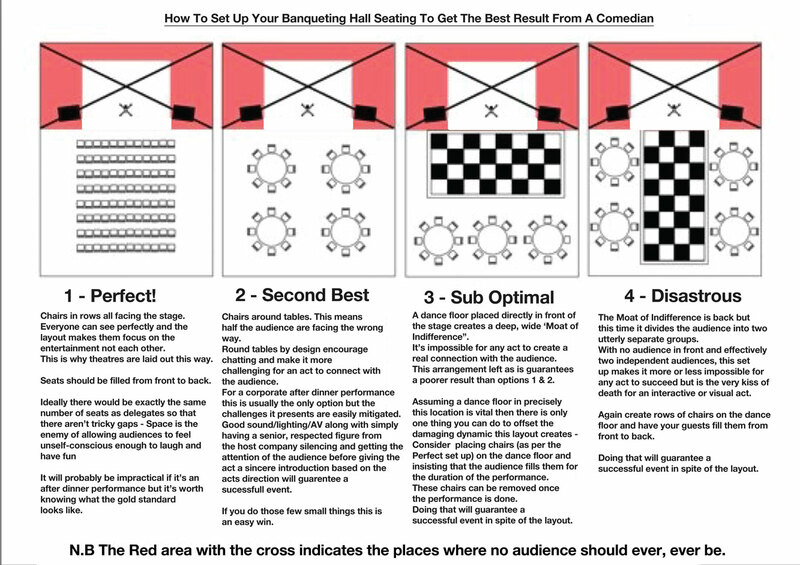 Comedy routines need the audience to follow narrative threads. Because comedy is essentially a conversion it also works best when there is as little distance between the comedian and the audience as possible – When did you last try to have a conversation with someone on the other side of a road? How did that work out for you? Thought so…. With the audience head on, all sat facing the stage, all sat as close together as possible. Now the practicalities of serving food to several hundred people in a ballroom & the desire to have a bit of a boogie later on mean some compromises need to be made so what should you do? I should just book one of the famous comedians off the telly right? The skills required to perform for a corporate audience are completely different from those required to perform to a studio audience or an audience that has paid a large sum of money out of their own pockets specifically to see you. Lets get real for a moment – You know the way your guests are cavalier and a bit wasteful with the free booze you lay on? That’s because “Free” is of less value than something you’ve paid for. An entire bottle of free champagne is worth less to someone at a corporate event than a £5 beer they’ve had to pay for themselves at the bar and subsequently the free fizz is treated with less respect. If that entertainment is a band then no one notices if people are detached and talking over them but if your entertainment is a comedian……. Unless they are experts at corporate entertainment they are going to die the death of deaths. If you are an after dinner act then, because they haven’t chosen to see you specifically or invested any money in seeing you, then for many guests you are effectively just a barrier between them, a free bar and the potential of a dance with the cute person in finance they’ve been flirting with all year. It takes a very specific skill set to go on and win the attention of a corporate room in the minute or two they’ll allow you before returning to their conversation. In my pre-showbiz days when I was a director in advertising I lost track of the big TV names I saw struggle year after year at the Media Week & Campaign Awards. In the BBC Funny Business episode “Gags to Riches” household name and extremely funny comedian Rhod Gilbert talked about how awful he was at corporate after dinner shows. He gave up doing them after a set for the Professional Footballers’ Association was met with utter silence for the full twenty minutes. All the big TV names honed their skills in comedy clubs not corporate events. But my background is the inverse of that. I started off doing corporate events and then moved into comedy clubs. Corporate shows require a completely different toolbox of techniques and tricks to comedy clubs. I came to comedy from the corporate world and had been making my full time living as a corporate after dinner act for five years before I even stepped foot on a comedy club stage for the first time in 2010. It’s the thirteen years experience I’ve had of the after dinner show market that mean I am the only after dinner corporate comedy act that can produce a three min show reel of nearly twenty Blue Chip corporate clients saying that I’m the best act they’ve ever booked. New Testimonial Reel With Contacts from Doug Segal on Vimeo. I hope that’s been useful in helping plan your next event and if you think I can help in any way, please contact the entertainment agencies you work with and have them contact my management.